FORMER FAI CEO and current Executive Vice President John Delaney has come under scrutiny in recent weeks after he sought a High Court injunction to stop the Sunday Times reporting a €100,000 loan by him to the association. Yesterday, The42.ie first reported that Delaney is set to leave the FAI, as his and other board members’ futures were discussed at meetings yesterday. Delaney has faced criticism after he refused to address questions regarding the €100,000 loan and his time as CEO, citing legal advice. Today, The Sunday Times reported on a number of of extravagant expenses by Delaney on an FAI credit card. Delaney has also been praised for his work at grassroots level, and in attending local events, with Kerry TD Michael Healy-Rae saying that Delaney “could only be accused of being passionately committed to your job”. So, what do you think? 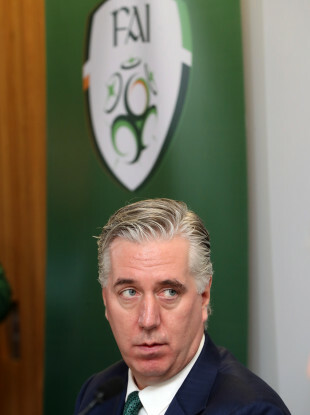 Should John Delaney leave the FAI? Email “Poll: Do you think John Delaney should leave the FAI?”. Feedback on “Poll: Do you think John Delaney should leave the FAI?”.